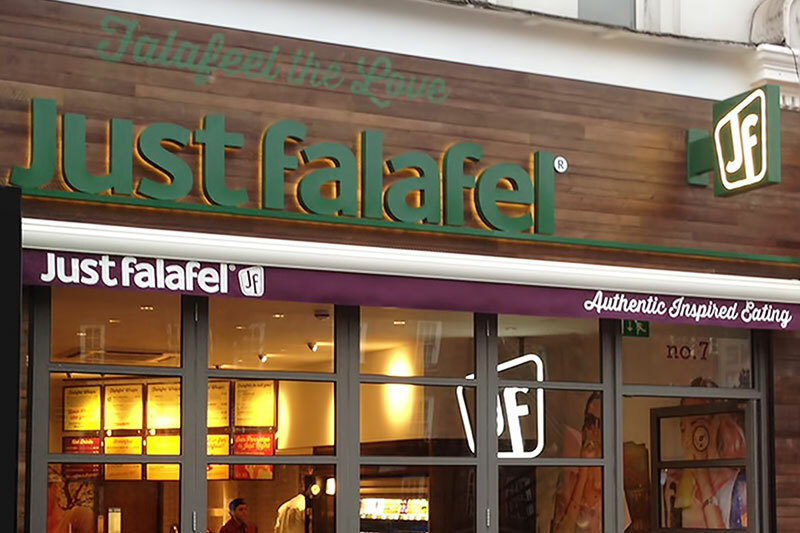 In November 2013 Just Falafel invited us to attend a site meeting to discuss their new brand concept for their latest UK store. From a single restaurant in Abu Dhabi they have grown to be the biggest falafel franchise in the world with outlets in 18 different countries. Their website says "Our recipe is to redefine tradition, revolutionize stereotypes and create a profound point of difference in the marketplace". Benson Signs were thrilled to be involved with this exciting new concept. 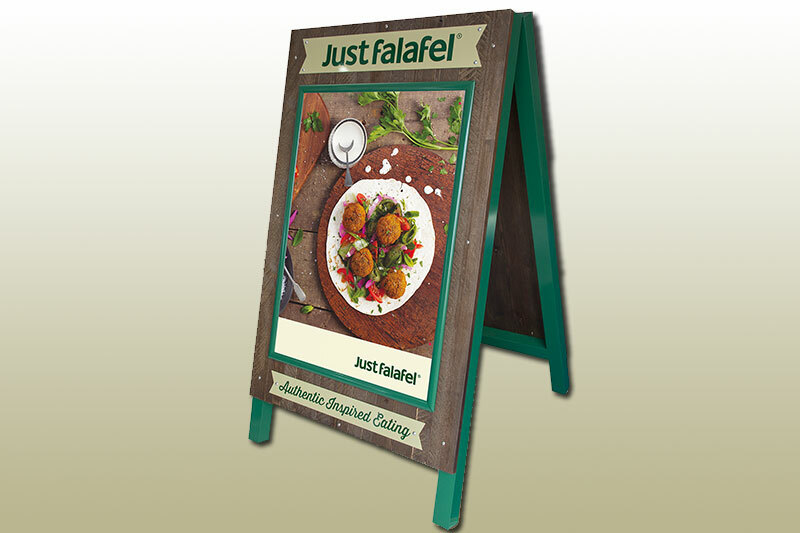 Just Falafel have already dipped their toe in the UK market with the opening of six sites. However, with their latest store on Fulham Broadway, they wanted to mix their authentic traditional approach with a modern colourful feel. Benson Signs liased with Just Falafel's senior management, in-house designers and project managers to develop the brand. We listened to what they wanted to achieve, took on board their suggestions, and created a presentation package illustrating how we thought the brand, signage, lighting and graphics could work. Subsequent discussions and meetings refined the ideas and ensured they were feasible. After some minor modifications the plans were approved and a detailed site survey was then carried out. We were given clear instructions to open prior to Christmas. Working closely with the main contractor, Cordery Build and designers, we successfully delivered the project on time and on budget. All our in-house resources were utilised - design, graphics, digital printing, routering, LED workshop, powder coating, general workshop and, of course, installation. 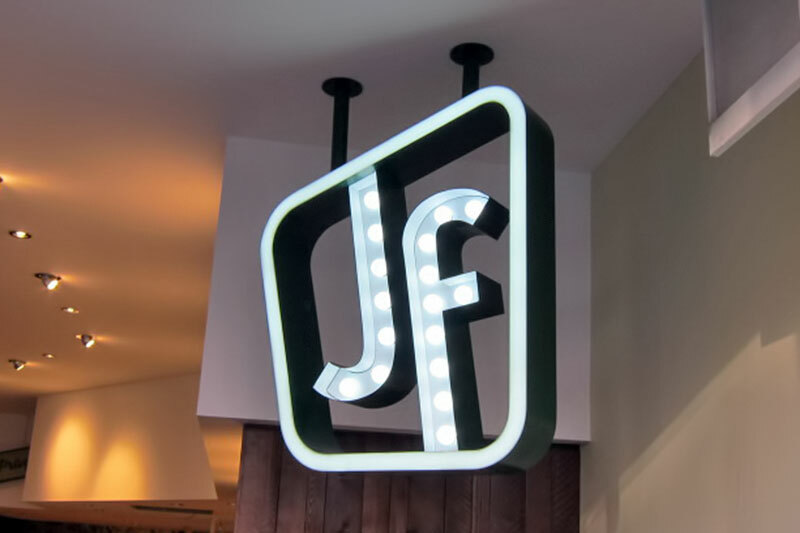 Adrian Liddiment, Operations Manager at Just Falafel said: "The JF site in Fulham was a complete change in direction for our concept and as such, last minute changes were inevitable. Bensons were able to take these on board and react immediately. We could not fault their standard of work, from initial drawings through to installation. They hit our very tight deadline and delivered on budget during a very busy Christmas period." The story was covered online by the Liverpool chambers of commerce here. 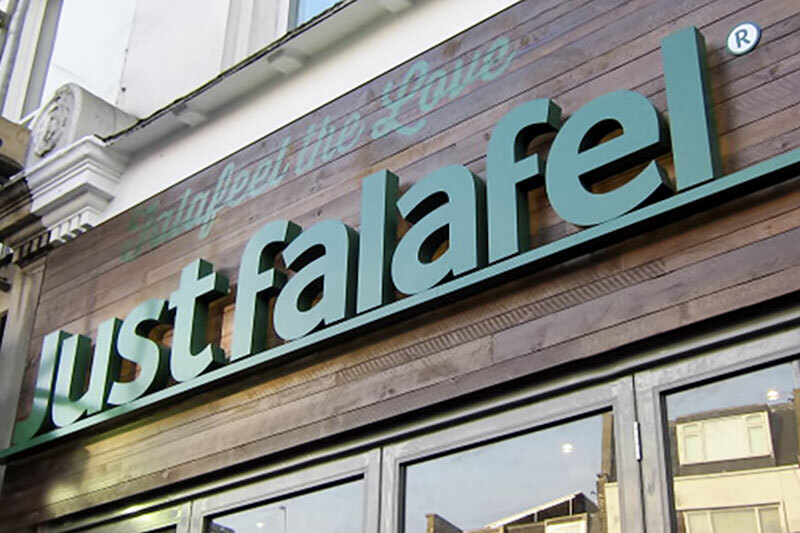 Eclectic signage scheme supplied to Dubai-based vegetarian fast-food franchise Just Falafel.